What Marvel Studios does is amazing. Their ability to bring comic book heroes to life is unsurpassed in cinematic history. From the casting, to the costuming, to the special effects, viewers can often declare, “Yeah, they totally nailed it!” That said, while Marvel’s screenplays can be terrific on many levels, their stories tend to suffer in their third acts. These climaxes always provide spectacular collisions of cool characters and pyrotechnics, but they often fall short in generating nail-biting drama. At the core of Ultron’s evil plan is a very compelling idea: Ultron schemes to wipe out humanity by causing a cataclysmic extinction event. These types of events are not science fiction, but science fact. 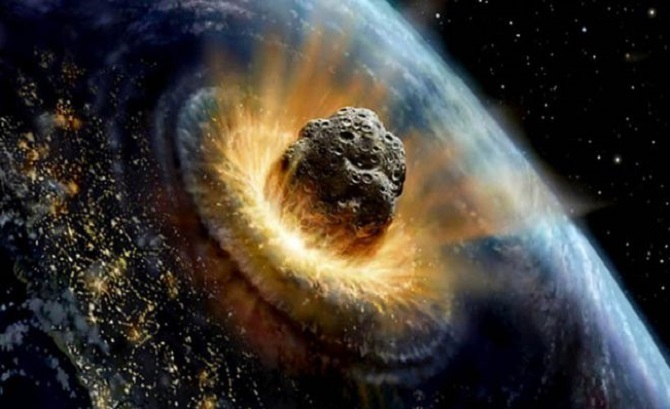 The asteroid that wiped out three quarters of Earth's species during the Cretaceous–Paleogene event, was a rock perhaps six miles across. With this as a measure, all Ultron has to do is raise a significantly sized landmass high enough - then let it fall. Gravity should do the rest. Grounded in reality, dramatic in scope - and potentially very visual. So why so little actual, heart-pounding drama caused by this in the movie? - Because this idea is not presented in a trackable, dramatically embraceable way. Instead, as presented by Avengers: Age of Ultron, it is an intangible, hard to imagine threat. While Ultron does briefly discuss his appreciation of extinction events before the third act, these words generate little drama. They're just talk, invoking little visual or emotional punch. Later, when we see Ultron lift a huge chunk of Sokovia, we can’t feel the global threat of it. The filmmakers seem to sense this as well, opting to spend most of the climax focused on the Avengers saving the town’s anonymous and uncountable locals. This failure of clearly dramatizing the main part of Ultron’s plan could be solved by learning a few things from the climax of STAR WARS (1977): The Death Star closing in on disintegrating the Rebel Base world is definitely a global event - one that builds great drama in the film. What does Star Wars do that is so different, that works so much better than Avengers: Age of Ultron? 1) Star Wars doesn't just talk about their big threat, it shows an earlier example of the “unimaginable” happening - before the third act; the Death Star destroys the planet of Alderaan. Star Wars makes the otherwise intangible, tangible - and characters we care about are impacted by it. Now the audience has a clear dramatic picture of the stakes of the coming climax. Compare this to the Ultron's potential catastrophic landmass strike, where the intangible remains intangible. Could Thor could have had a similar catastrophic event in his past - lost loved ones in some far away, annihilated dimension? Could Stark's Scarlet Witch-induced nightmare shown the wiping out of the world, with Hawkeye's farmhouse family, New York City, and the rest of humanity exterminated? Could the Vision have created a simulation for the Avengers so realistic it brings everyone to tears? Without the audience having some genuine experience of this otherwise unimaginable catastrophe, its understanding can be little more than intellectual. 2) In Star Wars, it is graphically demonstrated exactly how close the Death Star needs to get to destroy the Rebel’s base. We get clear, updated visuals on a computer screen as the Death Star moves into firing range. As the clock ticks down, we know exactly how long the Rebels have to prevent their destruction. Conversely, in Avengers: Age of Ultron, how high does the this flying Sokovian landmass have to get before all Earth is doomed? If Ultron wants to emulate the destruction of a giant meteor, wouldn’t it be clearest if it must reach same height? (i.e. the upper atmosphere). Instead, once Ultron's chunk of Sokovia is afloat, we get little more than sky, and then more sky - it’s too hard to gauge its progress. Does Ultron have a graphic that this terrible advancement is measured against? Or Iron man? Or Vision? Or anyone on Nick Fury's hellicarrier? What about the air incrementally running out for our heroes? Is it getting colder, windier? What's the barometric pressure? None of these potential measures are used - at least not clearly. Moment to moment, exactly how much time remains for the Avengers to save the day? These things are far too muddy. 3) In the climax of Star Wars, most of the characters are focused on stopping the Death Star. Han and Chewbacca are the only ones who don’t seem to be - and then they come back just in time to help save the day. It is notable that while Han and Chewie are doing "other things" - they are given almost no screen time. In Star Wars, everyone’s agendas are clear and ultimately aligned: stopping the Death Star before the Rebel base is annihilated is THE important thing. Q: How many Ultrons does it take to screw in a light bulb? A: If you have to count them, you're screwed. 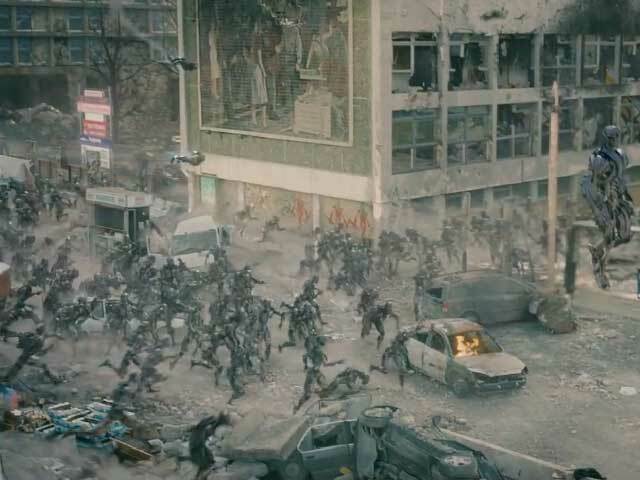 In Avengers: Age of Ultron, it would likely be better if no super-powered superheroes were assigned to saving pedestrians - that can sole job of Nick Fury, Hawkeye, War Machine, etc., etc.. - and should take a fraction of a screen time. Then ALL the heavy-hitters could focus on saving the world. If the Avengers fail at saving seven billion people, rescuing a few hundred (thousands?) is still a catastrophic failure. As we watch the the story’s climax, the rescuing of locals feels largely irrelevant - because it is. 4) In Star Wars’ climax, we understand exactly how Luke and the other Rebel fliers can stop the Death Star. 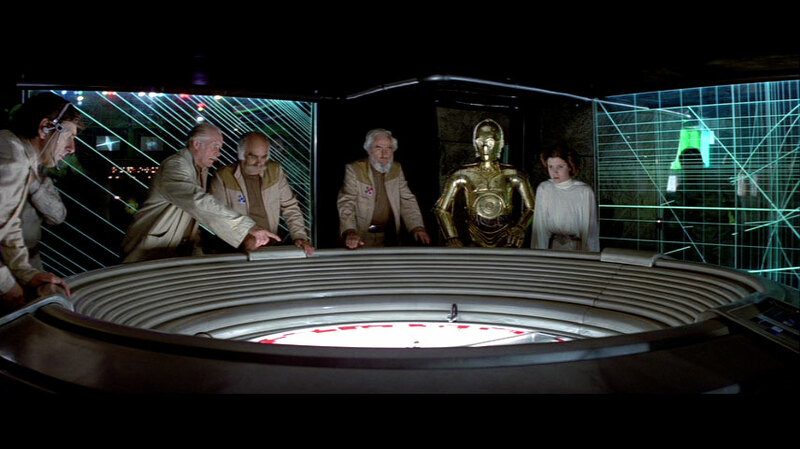 Star Wars (1977) Everyone is explained exactly how they can stop the Death Star, and how dramatically hard this is going to be. Then we see Luke and the Rebel squadrons clear attempts to execute their extremely difficult plan again as the clock ticks dramatically down. Star Wars (1977) - The Rebels attack the Death Star - their mission clear. This level of clarity would greatly help in the Avengers: Age of Ultron as well, where, when it comes to stopping the extinction event, it’s too difficult to pin down what the Avengers are trying to do to, how they eventually accomplish it, or exactly why it works. If Avengers: Age of Ultron had handled this one “extinction event” plot point as suggested above, its climax could have had some heavy-duty dramatic impact. IMO.